Call it a coincidence or tyranny of the conditions, I have to stand today in this special court under a special order to defend the charges which are baseless and false. More appropriately these charges are the creation of a mind that is enemy of the freedom of my country and a cruel joke with the people of Jammu and Kashmir who are fighting for liberation. History has given the verdict against those conditions and self-acclaimed rulers of Pakistan who have made me stand in this witness box. This verdict of history is so clear that no further explanation is needed. It has drawn a clear line between us and our hypocrite opponents. I take this proceeding as a compliment for myself and my comrades as future generations will have no confusion about our identity. Thus this command of Quran has proven true about this group of hypocrites: "And when they meet Muslims they say we have become believers and when they are alone with their Satans then say no doubt we are with you. We are just taking the fun. Allah takes the fun of them and develops their imprudence. Fact is that they have no vision." By the crime this group is committing against the oppressed people, it was inevitable that they should trap themselves in a situation where they are unable to escape. I have neither prepared any conspiracy nor been a part of any such group. My role is clear all the way through. However it is true that I have rebelled against obscurantism, slavery, capitalism, exploitation, corruption, cruelty, and hypocricy. If the ruling class of Pakistan, which is a product of imperialist system and is represented by the civil and military bureaucracy, call it conspiracy then I have no hesitation to accept it. For me this case against us is not unusual at all. During human history whenever exploitation and slavery are challenged the ruling classes have always relied on the word 'conspiracy'. But the history proves that in the fight of oppressed against oppressors, eventually the former won and the oppressive structure is crushed by the revolutionary struggle of the people. I have disliked self-praise but now when my role is being distorted, deliberately, I am forced to claim that at every stage of my life, I have not only supported the peoples strugggle against exploitation and oppression but always actively participated in it. I have consciously chosen this role for myself because I see it as sunnah of prophets and is a way of revolutionaries. I have no doubt about the success of this role and the welfare it brings for the people. I can not refrain from bringing this fact in the notice of this court that apparently only six persons are made involved, but the actual motive of this case is to crush our linberation movement. Pakistani bureaucracy should know that no matter what turns our fate takes as a result of this case, they will achieve nothing but disgrace and failure, as for as their actual motive is concerned. If the struggle for freedom was to be stopped by the court rulings there would have been hardly any free nation on earth today. If the evolution of civilization, democracy and freedom was to be prevented by the existing judicial or administrative system no revolution would have taken place from the beginning of history. Decisions about the movements for welfare and freedom of people are not made in the existing courts, but the evolutionary process of human history gives the verdict of these govemnts. For the courts themselves are the product of that system that these movements are aimed to change. It is for this reason that in some cases verdict given by these courts as present are proven meaningless and relinuished. It is not possible here to give details of all those conspiracies made against my country and my people. However it is imperative to highlight those aspects of these conspiracies that are exploited to construct this case. This is not done by the unmistakable enemies of our people but by the imprudent and wicked 'friends' who have despicably occupied the power in this unfortunate country and have subjugated not only a hundred million of her people but also put its existence at stake by their malicious actions for keeping power in their hands. It is obvious that a leadership which has no sympathy for its own people cannot be hoped that it will extend any friendship to a nation which is still fighting against foreign occupation. 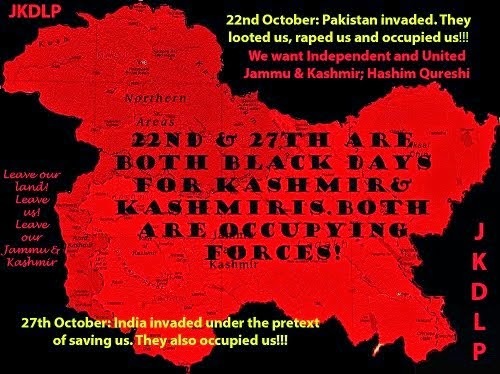 No one can stop men from claiming that every ruling power in Pakistan has exploited the Kashmir issue for last 25 years for its lust for power and abused this issue to mislead the people of Pakistan who have and still do support the freedom of Kashmir. When power came into the hands of military dictatorship this conspiracy has become even more dreadful. Division of Pakistan is only a logical result of this conspiracy. This is said that a conflict was started from the day NLF was formed; between our struggle and the bureaucracy and military dictatorship of this country. The roots of this conflict are in the disagreement on aims and strategy. 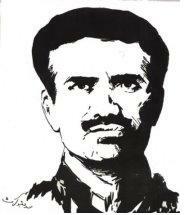 Military rulers of this country never liked our concept of armed struggle. Not only they did not like it, they always tried to crush any such struggle. The story of such conspicuous incidents is too long to cover here in detail but it was never come to a stage of branding us as enemies of this country This time chosen by the military dictators to declare us enemy of the country was that when they were giving the final touches to their conspiracy. It was last week of February 1971. In the President's house in Rawalpindi, the dictators were planning to prevent the transfer of power to the elected members of 130 million people. From its formation to 24 February 1971, no faction of rulers ever suspected it or its activities, including Ganga Hijacking. However, as part of their conspiracy, the rulers decided to use NLF and Ganga Hijacking on false grounds to justify their anti-people and anti-democracy designs. The initial instructions were issued from President's House Rawalpindi. Inter Services Intelligence Bureau was ordered to investigate the hjacking case and keep the freedom fighters away from public and press. They should be transferred to a distant location. Responding to our enquiry we were told that country is in a crises. To solve the conflict with Mujeebu'r- Rehman on constitutional matters we need the nation to be calmed on Kashmir issue. We were also told that Shiekh Mujeeb is for friendly relations with India and does not like to promote any confrontation for we did not want political crisis of Pakistan to be exacerbated. We co-operated and agreed on freedom fitghters' transfer to Tanda Dam, district Kohat. Only a few days later the proposed meeting of national assembly was postponed. Hence the crisis was intensified. What happened in East Pakistan after the declaration of former military dictator was pre-planned. Sheikh Mujeeb was invited for negotiations with former President in Rawalpindi. When he refused, another declaration was released in March 71 from Presient's House that former President was going to Dhaka for negotiations. Just one day before, Yahya Khan's departaure for Dhaka, it was announced by the foreign office that hijacking case will be investigated. Replying to our explanation we were told that this is to decrease the bitterness during Yahya -- Mujeeb negotiatins where it is inevitable that Mujeeb , who has already demanded an enquiry into hijacking, will raise this issue. We were also told that international pressure on Pakistan is also increasing and to prove that Pakistn is not involved in the hijacking we need such measures. We were assured that if neceessary, a commission will be formed but it is likely that this stage will not come. The commission was appointed at the time when Yahya -Mujeeb negotiations entered into concluding stage. The impression was given that the commission is nothing more than an eye-wash. Actual motives were to come out only on 27 March 1971 when military operation was started in East Pakistan. Only two days after this commission has started its proceedings as well. Among the three members of the commission, two were from the intelligence depatment and the third Mr. Rahat Chhattari was the one whose services were terminated from by the first elected government of this country under the allegation of corruption. This chain of events shows that this case had special motive which can be nothing but the search for the justification for civil war situation in which the country is bourght by the military dictators. The report compiled by the commission according to the wishes of the rulers has fulfilled their need. We were arrested on 14 April, six days before the report was presented to the President. And to crush our struggle mass arrests were made, memories of which are terrifying. But these rulers who were overwhelmed by the lust of power could not understand that lie is bound to be defeated. The 'nature' did not take long to give its verdict. The rulers reached their logical end before making us escape goats. It is easy to talk about freedom. But it needs a lot more courage and patience to fight for freedom. This is the path where every turn is full of tests. You go through such stages where your own friends on whom you relied, don't want to know you for their vested interests. They, even, leave you and make alliances with enemies. I have gone through three stages of state torture; first in occupied Kashmir, then in "Azad Kashmir" and finally in Royal Fort ( Shahi Qillah) Lahore, which is the remains of colonial era. As time is not sufficient to go into the details, I would give a brief account. At all three places the purpose of torture was completely different. 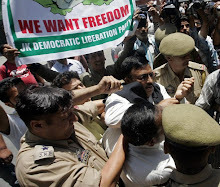 In Indian occupied Kashmir, occupying officers were looking for facts about our movement and about myself. In Muzaffarabad, "Azad Kashmir" the FIU (Federal Intelligence Unit) was not looking for facts, but they wanted me to confirm their assumptions and Gestapos in Lahore Fort were torturing me to tell utter lie and to give a false statement as part of their conspiracy. Only the administrative machinery of the oppressive rulers of this country could have done what was done to us to distort the facts and to construct the stories and characaters. Some details of the torture, of which we were subjected in Lahore fort, are given by my comrades in their written statements. But there was a lot more done in the Fort. The fact is that some details are so shameful that it is not possible to bring them in writing*. I leave the decision about what happened in Shahi Qillah (Royal Fort) for the day of judgement. Whatever ruling is made by this court, I can clearly see that it cannot do justice in this case. It is not that I do not trust this court, but it is the self-constructed nature of the allegations made against us, for they can't be defended in existing conditions. The false nature of these allegations cannot be proved until my country is divided. However, it is my faith that the dawn of freedom will fall in my country and the line of division will be trodden. This will be the time when facts about my life will come out. Only then I will get justice and this will be done in the court of history. That day my people will know the reality of the allegations, by both the Indian and Pakistani rulers against me, of being an agent of India or Pakistan. During the examination this court has enquired about the suspicion shown by FIU Major. Naseer Gul in his report about my escape from Srinagar prison. Having read this report in full, I maintain that it is totally against the facts and nothing more than a biased view of a military officer. All contradictions, which this 'expert' intelligence officer has pointed out are rooted not in my account of escape, but in his views about peoples' armed struggle. Product of colonialism, Generals hate the concept of peoples' army because it challenges the monopoly of General 's on military resources. It is a historical fact that military dictators never supported any organisation engaged in liberation war. On the contrary, they made contacats with the enemies of freedom fighters. During martial regimes, the armed struggles of Palestine, Algeria .Vietnam and other African countries were presented as negative. The military rulers of Pakistan never supported a peoples' amed struggle in Kashmir. They hated it as much as the Muslims of early period hated pig meat. It is this hate of military rulers towards peoples' armed struggle, which has made me and my comrades the target of brutal torture and humiliatiaon. * We were subjected to brutal torture in Shahi Qillah. If I disclose the details of the shameful treatment to which Bhat Sahib has alluded, then these will become cause for virtuous and sincere Pakistanis to hang their heads in shame. Therefore, following in the footprints of my leader, I maintain silence in this matter. 1. Ganga hijacking case was framed against us by Pakistani military junta and bureaucracy because they needed sacrificial goats for the separation of East Pakistan. 2. Pakistani military junta and rulers have never been sincere to the freedom of the people of Kashmir. 3. 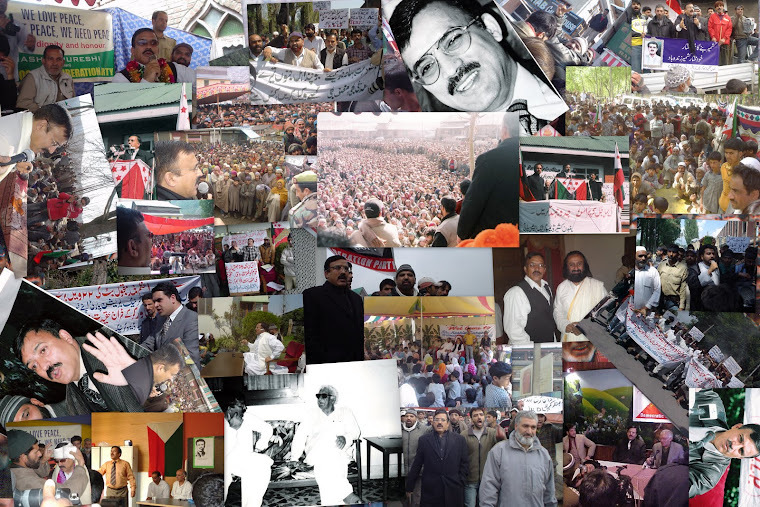 Ganga hijacking case was a conspiracy against the rising national liberation movement in Kashmir. 4. After this statement the story given by Alastair Lamb in his police reports - based work Kashmir: A Disputed Legacy is proved nothing but a heap of falsehoods and concoctions. The rest of demolition exercise is done by the statements of late K.H. Khurshid and Major Rahim Shah together with what transpired in Ashraf Queshi's meeting with Alastair Lamb and his wife in Lahore, Pakistan, in 1995.